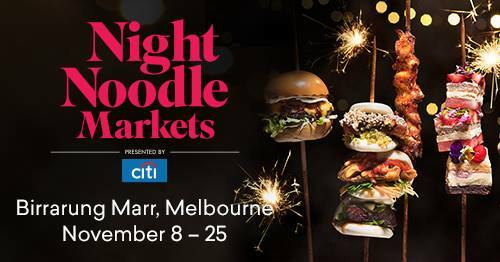 The Melbourne Night Noodle Markets will return to Birrarung Marr from November 8 – 25, setting the city alight with the smells, sights and sounds of over twenty sizzling Asian food stalls. Food-lovers can tick destinations off their culinary bucket list, indulging in unique dishes inspired by street food from all corners of Asia including sizzling Filipino skewers from Hoy Pinoy, Puffle’s Hong Kong-inspired egg waffles, Korean tacos by POKLOL, and Taiwanese style steamed buns by Wonderbao. This year will also see the return of crowd favourites such as Waffleland, Teppanyaki Noodles, Donburi Station, N2 Extreme Gelato, The Original Korean Twistto Potato, Black Star Pastry, Mr Miyagi, Sambal Kampung, Shallot Thai, Wonderbao, Bangkok Street Food, The Wagyu, Nem N Nem, and Chinese Dim Sum King. There will also be exciting new additions to the Night Noodle Markets family including Miso Fresh Food Truck, Bao Brothers, Red Spice Road, Apples + Pears, Son In Law, David’s and Oriental Tea House. To make things quick and easy, the markets are also cash-free so guests can spend less time queuing and more time enjoying the night. All major cards welcome. Menus to be announced soon! FREE ENTRY | Cash free – all major cards welcome – dogs welcome!